You have the privilege of growing a child who knows the love of God personally and knows how to love people well. God’s first choice for receiving and experiencing love is the family. Warmly snuggled in this incubator, love nurtures life, feeds souls, and calls forth the blossoming flower of God’s unique individual design in every person He has created. Then love calls for love to be given in return. Home is where a child takes the first tentative steps from receiving love to giving love. At home, parents and children learn that selfishness and love can’t coexist. And at home we learn what to do when we hurt others and fail to love well. The home is God’s supreme training ground for the life skill of love. And as a parent, you are God’s best choice for communicating His unfathomable love to your children. You are also His original choice for teaching and training your child to love others. The most well-known verse in the Bible, “For God so loved the world, that he gave his only Son, that whoever believes in him should not perish but have eternal life” (John 3:16), sums up God’s ultimate motivation toward us: His great unfathomable love. Love sent Jesus Christ to dwell among flawed, broken humans … to be our Immanuel. Love motivated Jesus to live a perfect life so that He might woo us back to the Father. Love kept Jesus nailed to the cross when He could have called on a legion of angels to rescue Him from His agony. Love did all this so that we might know the Father and live with Him forever. All because He wants a relationship with us. First John 4:19 tells us, “We love because he first loved us.” God reached out to us first. He made the first move. And because He wants His family to be full of healthy relationships with others. When asked, “Teacher, which is the greatest commandment?” Jesus answered, “You shall love the Lord your God with all your heart and with all your soul and with all your mind. This is the great and first commandment. And a second is like it: You shall love your neighbor as yourself” (Matthew 22:36-39, emphasis added). Who are your closest neighbors? Your spouse and your children. If you miss engaging in relationships at home, you’ve missed Life Himself. 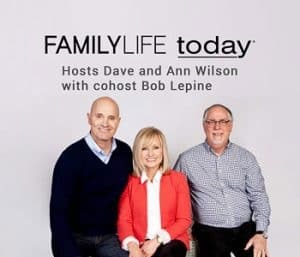 You have the privilege of growing a child who knows the love of God personally and then how to love people well with healthy relational life skills. And because teaching the limitless love of God to our children is an impossible task, God graciously gives us wisdom to do what we cannot do on our own. 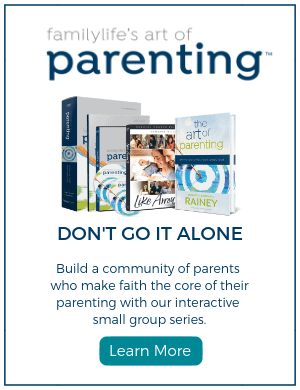 Make faith the core of your parenting with our free online Art of Parenting Course. Our second son was full of boundless energy. My repeated reminders, “Don’t throw balls in the house. Take it outside,” usually jogged his memory, and off he’d run. But I (Barbara) couldn’t always keep ahead of him. One day from the kitchen, I heard a distinct crashing sound and subsequent tinkling of falling pieces. Samuel had ignored our house rule and had just broken something in the living room. Walking to investigate, I found lying in multiple pieces the little Hummel figurine my grandmother had purchased in the 1950s on a trip to Germany. Apple Tree Girl had been a happy sight to me when I caught glimpses of her perched on the top shelf out of children’s reach. Why keep her wrapped in tissue in a drawer when I could enjoy the sweet memory of my grandmother’s gift amid the daily drudgeries of my life? I was greatly disappointed, both to lose this gift and to know my instruction had not taken deeper root in Samuel’s 5-year-old heart. How many times did I have to repeat myself? I sent Samuel to his room to sit on his bunk bed. I needed time to cool off and decide what to do. I was also hoping his banishment to solitary confinement would allow him time to reflect on his error while I finished dinner. With great confidence, I can assure you my response was not natural. My natural heart wanted to be really angry, to let him feel how I really felt. But in the part of my heart that wanted to please God, to do the right thing with my son—whom I did passionately love more than the silly porcelain figure—I knew what mattered most was a relationship with my son. God helped me focus on what mattered, Samuel’s heart. And my heart, too. On that day I chose God’s way over mine. The relationship mattered more than the rules. He still received a consequence, a spanking given with love and prayers spoken out loud over his little body snuggled in my lap. The momentary pain would be a reminder the next time he was tempted to ignore the rules. And as always after consequences, I hugged him close and repeatedly reminded him how very much I loved him. Relationships of love matter supremely in your home. Adapted from The Art of Parenting, by Dennis and Barbara Rainey, copyright © 2018. Used with permission of Bethany House.